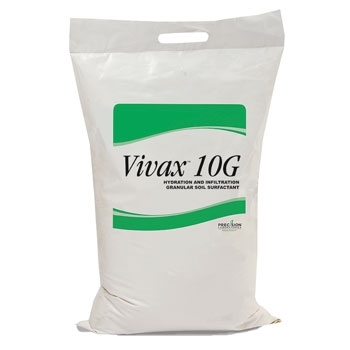 Vivax™ 10G is a combination of surfactants that increase volumetric water content and improve water infiltration across a wide range of soils and turf types. Its granular formulation makes Vivax 10G suitable for use on golf courses, athletic fields and other turf areas. Apply Vivax 10G at 3.5 pounds per 1,000 sq. ft. Each 42 pound bag treats approximately 12,000 sq. ft.